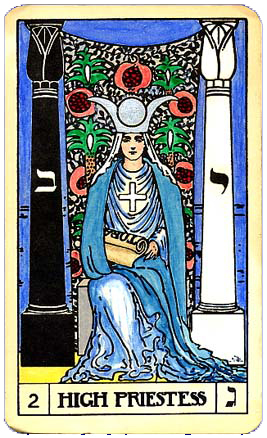 The High Priestess represents the subconscious flow of creative intelligence. Draped in the knowledge of the ancient mysteries, she understands the art of reflection and the balance between inertia and action. She is symbolic of water and the Moon. The figure of Divine Inspiration, she teaches us to look within for the light from above. Confer with The High Priestess to strengthen your intuition, develop your memory, aid the healing process or improve self-confidence. The High Priestess image on journals, T-shirts, and mugs. Affirm: I Am One in Body, Mind and Spirit.